Verizon Wireless, one of the most successful mobile phone carrier, with outstanding smartphone sales, has just unveiled a new pricing on the series of Android-based smartphones on its network. Verizon slashed the price tags of its DROID series by $100, while many of the smartphones are available for free upon the signing of a contract agreement. Those devices which were earlier available for less than $100 from Verizon, are now free, while others have been reduced to increase sales and revamp the Android fever. The Verizon DROID 2 by Motorola and DROID INCREDIBLE by HTC registered a price decrease of $49, making them free on contract. Apart from that, variety of new handsets also got their prices reduced, including the DROID 2 GLOBAL by Motorola or DROID 2 GLOBAL by Motorola in White, both available at an attractive price of $99. 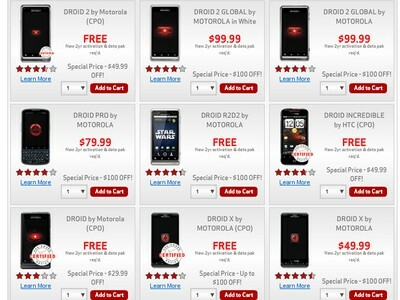 Motorola’s DROID PRO is no available for $79, while the DROID X by Motorola can be acquired for $49. Furthermore, the DROID R2D2 by Motorola is now free, running on a two-year contract. On the other side, users eye this move as, the carrier on bringing in new smartphones with need to make room in their warehouses.